Monday UPDATE UPDATE: Final weekend numbers are in, it appears studios nailed the Sunday estimates. Sunday UPDATE: Stratospheric it was. Crushing it with the adult demo and drawing in nearly equal numbers of men/women, Gravity soared off with $55.6M in its debut frame, a new October record. How crucial was 3D to the enterprise? A massive 80 percent of the cash came via the added dimension, with IMAX accounting for 20% of the total haul. For some perspective, its A- CinemaScore is the same grade assigned to The Smurfs 2 and The Wolverine. On the epic fail side of things, Runner Runner blew a hammy, tanking to the tune of $7.6M, a critical blow to Justin Timberlake's already-on-life-support-as-it-was acting career. Sandra Bullock opens pictures — mostly. Three of her past five films – The Heat, The Blind Side and The Proposal – topped $30M in their respective debut frames, each clearing $150M domestically, the one about protecting the pigskin plowing past the $250M barrier. That's the money-making Sandy. The 49-year-old's other two projects – Extremely Loud & Incredibly Close and All About Steve – tanked. 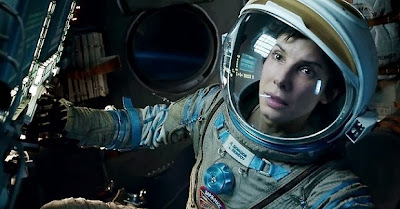 There's zero chance Gravity joins that pair of Bullock bombs, it's a sure-to-be smash given the undeserved ungodly buzz surrounding the George Clooney co-starring, outer-space spectacle. Though the question looms: Will demos outside adults be drawn in? 1. Gravity $37M (↑) – 3D upcharge adds coin to the coffers though it remains to be seen if those under the age of 25 will take the insanely-overrated ride. 2. Cloudy with a Chance of Meatballs 2 $21M – With no other family options, Flint Lockwood's fortunes improve after a so-so debut. 3. Runner Runner $13.5M (↓) – Will speak more to JT's box office pull than Ben Affleck's. 4. Prisoners $6M – Didn't hold up as strongly in its second frame as expected. The arrival of the adult-skewing Gravity doesn't help. 5. Rush $4.5M – Ron Howard's F1 drama debuted with the horsepower of a Yugo.